Times: 11:00 a.m. – 12:15 p.m. Location: Wingate Hall Room 302, campus of Wake Forest University, Winston-Salem, N.C.
*Module descriptions are included below. After completion of the workshops, participants will receive a “Certificate of Completion” for the modules completed. Payment is expected at the time of registration. All major credit cards accepted. Practicing healthy life limits leads to more balanced relationships, regular renewal of a sense of call, and ongoing discovery of God-given strengths and passions. Understanding and setting healthy limits is essential as we strive to enliven our Gospel work to create more just and sustainable communities. While it may be hard to see when “healthy boundaries” denominational and/or presbytery requirements are announced at meetings or outlined in an email, exploring healthy relational and personal limits and renewing our commitments to healthy choices about how we use our time is a vital part of ministerial vocations. Discerning and living within healthy limits is also essential to maintaining a positive self-image as a leader and to modeling for others how to embody the belief that we are created in the image of a God who respects and values who we are as individuals and who we are in community with others. Also, healthy and vital ministries rely on trust and mutual support to create spaces of welcome and safety for all. What does it mean to be created in God’s image and how does that realityn shape how we value ourselves and others? What does Scripture say about healthy relationships and setting limits? Can I say “no” and still be a loving person? How can I be healthy in my use of technology (email, Facebook, Twitter, Instagram, etc.)? How can I answer someone who wants more of my time, love, etc.? Why am I bitter and resentful about my work and relationships when I want to be joyful and loving? How do I nurture “Sabbath” in my life and work and why is that important to my health and the health of my community? Consider biblical and theological underpinnings for what it means to be created in God’s image and how healthy life limits grow out of a sense of self and others rooted in God’s image. Explore and develop an awareness of power and vulnerability within pastoral relationships. Consider challenges that arise as a result of power and vulnerability within relationships, for example dating, friendships and dual relationships. Consider appropriate responses to sexual misconduct from theological perspectives as well as from within the parameters of sexual misconduct prevention policies. Facebook, Twitter, Pinterest, WordPress, Instagram. All of these words and more are now common to our societal vocabularies because they are common features of many people’s everyday lives. People today spend a lot of time online, and churches and other ministries benefit daily from internet tools. Some say social media is the new town square. Others steer clear of social media and other internet tools. What is the role of pastoral leaders in helping congregants discern the gifts and challenges of social media for ministry? How is the internet shaping our understandings of community, friendships, and even preaching and worship? What are some of the dangers pastoral leaders face as they determine their personal use of internet technologies? What are some strategies our congregation can use to create healthy social media guidelines for our staff and leaders? Questions of money, finances, and budgets can stir complex questions and even create quandaries for religious leaders and their communities. This workshop explores how personal and congregational money matters can be life-giving spiritual dimensions of leaders’ and communities’ lives instead of being only cause for worry, stress, and anxiety. The workshop will consider the spiritual and theological dimensions of financial well-being for faith communities and leaders and explore healthy responses to boundary challenges that arise related to personal and/or congregational finances. Consider the importance of self-care and peer support to healthy personal and communal lives. Consider the spiritual and theological dimensions of Sabbath and self-care. Explore sustainable strategies for self-care. Explore examples of Christian contemplative practices. Examine several models of “pastoral crisis interventions” and “care for caregivers” strategies. People who are impacted by a disaster because she or he is already in an established role, has a core of relationships, and brings a faith perspective that speaks to the need for meaning that is so pervasive in the human experience of suffering. Congregations have the amazing opportunity to nurture the mental, spiritual, and physical lives of children and teenagers. Creating healthy and safe communal experiences for children and teenagers is a crucial congregational responsibility. This workshop invites participants into a deeper understanding of what it means to nurture the faith and growth of children and teenagers. Education is key to preventing child and teenager sexual abuse in congregations. Ministers and congregations have a responsibility to be aware of the realities of sexual abuse in our communities and to develop prevention and response strategies. This workshop explores a range of congregational and denominational child protection policies and reflects theologically on God’s promise to journey with us—and our children and teenagers—through our lifespan. The primary question that centers our work in this module is this: How do we work to make our churches sanctuaries, places that are safe for all people to encounter and dwell with God? Crainshaw is Interim Dean and Blackburn Professor of Worship and Liturgical Theology at the School of Divinity. She is also a teaching elder in the PCUSA and a member of Salem Presbytery. Crainshaw’s experience with healthy boundaries education includes teaching related courses at the School of Divinity and serving on COMs in two presbyteries, Salem and Shenandoah. She was certified in 2015 to teach Healthy Boundaries 101 and 102 by the Faith Trust Institute. She has taught Healthy Boundaries workshops for Salem Presbytery and the Virginia Synod ELCA. The workshops include primary elements from the Faith Trust Institute’s curriculum as well as elements from Crainshaw’s work and research. She believes that education and prevention—and in particular understanding the theological and spiritual dimensions of healthy boundaries—are essential for safe and healthy communities of faith today. FaithTrust Institute provides multifaith and religion-specific intervention and prevention training, consulting, and educational materials for national, state, and community faith-based and secular organizations. People in crisis often look to their faith leaders for guidance and assistance. Religious values of justice and equality summon us to affirm the dignity and worth of every human being and the right of each person to live without fear or threat of violence. Our religious traditions obligate us to work towards an end to sexual and domestic violence in our communities and in society at large. 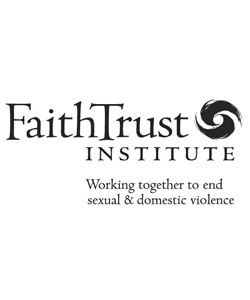 FaithTrust Institute provides faith communities and advocates with the tools and knowledge they need to address the faith and cultural issues related to abuse.